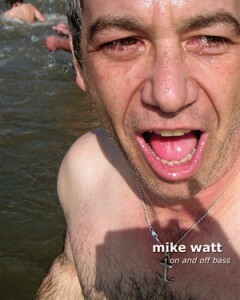 “Mike Watt: On and Off Bass” is getting a lot of buzz. And for good reason, considering the author and photographer is the legendary punk bassist himself. The LA Review of Books‘ Craig Hubert offers a keen and insightful review of “Mike Watt: On and Off Bass” in this week’s edition. Hubert notes, “[Watt] has a keen eye for capturing unexpected disruptions within seemingly normal, even mundane situations. . . Loss is prevalent throughout “On and Off Bass,” but it is undercut with hope; there is always the sustaining reservoir of inspiration — from Boon, from music, from San Pedro itself — to dip back into. It’s the same reservoir that John Coltrane described in a 1966 interview with Nat Hentoff: ‘There is never any end. There are always new sounds to imagine, new feelings to get at. '” Read the full review here. MTV Hive writer Austin L. Ray is impressed with the econo nature of the new Three Rooms Press book, “Mike Watt: On and Off Bass” by the legendary punk bassist. The book features photos from Watt’s gallery show at Track 16 in Santa Monica, juxtaposed with poetry, reflections and diary snippet from Watt’s massive 1,500 page collection of musings on Hootpage.com. The article features Watt discussing the origins of some of the photos in the book. Check it out at MTVHive.com. The New Yorker loves “Mike Watt: On and Off Bass”, calling it an “unusual and beautiful photographic memoir.” Read the full review here. TWI-NY: What does being on the water mean to you? Mike Watt: That time of day, the crack of dawn, is almost like Pedro is mine. It’s not like I own it, but I’m the only one around except for that nature you’re talking about. Being in the kayak, that feeling of the sea, it’s a trippy feeling. Rockerzine writer Katy Dang raves about “Mike Watt: On and Off Bass,” noting that through the photos and text, “Watt brings his world and his experiences into focus, sharing them unabashedly with whoever chooses to come on board. He brings the past into the present, never merely resting on his laurels and always missing D. Boon, his missing friend.” Read the review and an in-depth interview here.